My name is Damion Jenkins, and I have a real passion for nursing education! I have been teaching nursing related college courses for over six years, and have more than 20 years of leadership and mentoring experience. I have helped many health profession students, nursing students, new grad nurses, and even professional nurses master strategies for success! From facilitating the learning of eager students, to working with facility management in the delivery of nursing staff education and development, I take pride in helping my students and clients meet their individualized needs. Before pursuing nursing, I’ve held many positions that gave me wonderful opportunities to train, lead, and teach those around me. For over 15 years, I specialized in customer service and had the pleasure of teaching countless individuals a variety of strategies that improved their ability to deliver the best customer service possible. 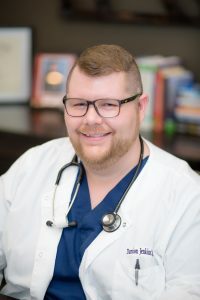 Fortunately for my clients, colleagues and patients alike, I took a lot of what I learned in my previous career and I apply it to my daily nursing practice and education consultation services – thus creating the delivery of nursing excellence! The Nurse Speak, LLC. is a one-man operation where I focus on creating customized services to meet the individual needs of my clients. 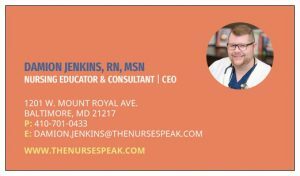 At The Nurse Speak, you can find services that include, but are not limited to: individualized tutoring, mentoring, and consulting services for students, new grads, healthcare facility staff, online nursing CE companies and blogs! From the creation and implementation of customized tutoring plans, to authoring continuing education courses, The Nurse Speak can help! 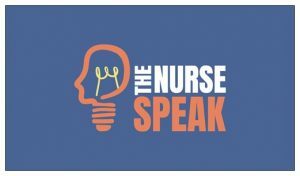 The Nurse Speak also features a blog, where nursing students, new graduate nurses, professional nurses, and those interested in learning more about nursing can keep up with the latest issues, trends and strategies for success within our expanding profession. In 2015, I developed a nursing blog to share experiences, provide helpful advice, and create dialogue that would help in reaching my goals of advancing the nursing profession. Within it’s first year, the Nurse Speak Blog reached an international audience, and my work was being recognized as a valuable contribution and resource for nursing by The American Journal of Nursing, and NSW Nurses and Midwives Association. With the blog gaining more attention and traffic, I partnered with several continuing education companies to author nursing education content, and blog articles, while also providing private tutoring services for students, and thus The Nurse Speak, LLC. was born! Here at The Nurse Speak, nursing students will enjoy expert study tips and test-taking strategies that will help them meet their academic goals. The Nurse Speak’s personalized approach to tutoring provides a comfortable and stress-free learning environment that really promotes individual creativity. Since everyone learns differently, I pay special attention to student preferences in order to help them master strategies for success! The Nurse Speak specializes in creating personalized test prep and tutoring sessions that help clients pass their LPN or RN licensure exam. Exam prep and tutoring students will enjoy a relaxing tutoring environment where the focus lies on helping clients develop and master test-taking strategies for success! To learn more about my licensure test prep success stories, please visit the testimonials page and see what my happy clients have to say about my service! Certified Nursing Assistant, Geriatric Nursing Assistant, Patient Care Technician, and Certified Medicine Aide students will enjoy expert study tips and test-taking strategies that will help them meet their learning needs. In addition to individualized tutoring, clients will gain access to several helpful resources and tools to guide them throughout their program of study! The Nurse Speak provides a variety of nursing education and consultation services based on facility and organizational needs. Services as a contracted nurse educator and consultant include, but are not limited to: contributing and writing for nursing continuing education companies, writing for nursing related blogs, providing staff nurse in-service education, nurse staff development projects, and working with facility nursing staff to improve patient satisfaction scores.